The idea of a counterpoint villain to Captain Cold was probably inevitable, although I probably would have waited a few issues before actually pairing the villain Heat Wave with said Captain. But Julie Schwartz apparently couldn’t wait for this beautiful Infantino/Anderson cover and so right out of the creative gate Heat Wave joins CC to battle the Flash. So eager are the editor and writer to get this going that they eschew the usual thoughtful origin story for the new bad guy and just have him suddenly appear on the street which gives a bit of a hollow feeling to the proceedings, making the story more about gimmicks than about people. This pretty much runs counter to author Broome’s traditional approach which was to imbue the participants with more personality and thus humanizing even the most dastardly of miscreants (can’t believe I actually just wrote “dastardly” there). 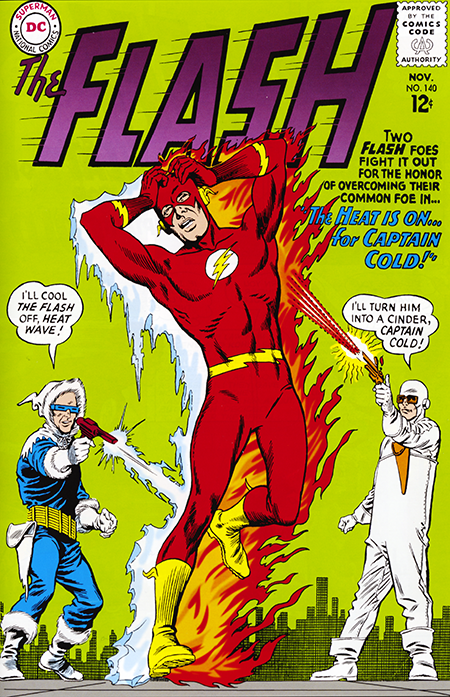 While I’m not a huge fan of all of the incessant retconning going on with characters these days, at some point along the way during one of the seemingly hundreds of new Flash iterations, I read a story involving Heat Wave in which it showed him as a child with pyromanic tendencies that ended up with him accidentally murdering his family. If ever there was a psychological backstory to explain an evil doer’s origins, this was it. I remember having picked up the comic for its incredibly cool cover, but it was the story inside that left the lasting impression. I would have loved to have been able to pull it up and do a side by side comparison, but that comic book was one of the casualties of selling off the bulk of my comic collection a few years back. Just trust me when I say that it was a top shelf piece of writing that pretty much torched all previous versions of the character. On the other hand, part of the payment for my collection was the dealer completing my Silver Age Flash run, which means that our journey through this historic and folkloric (as the Car Talk guys used to say) body of work can continue unabated. A Silver Aged lining as it were.